There are 13 people listing GREECE as their place of birth in this Ancestry.com database. I have transcribed their names and listed them below. If you do not have a subscription to Ancestry.com, most U.S. libraries offer access for FREE. 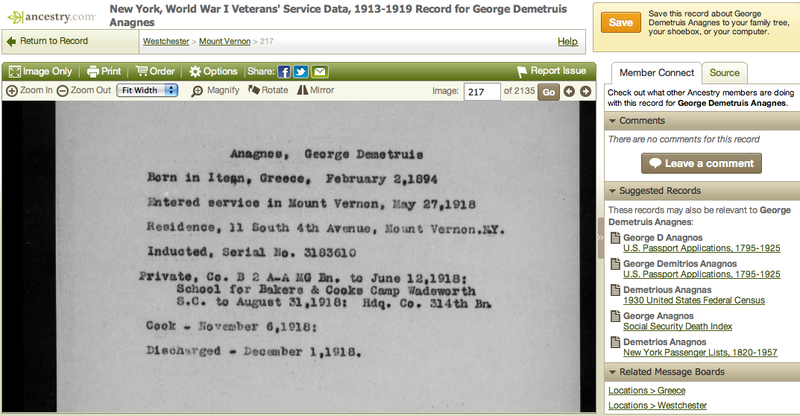 This database contains documents relating primarily to soldiers from New York who served in World War I. 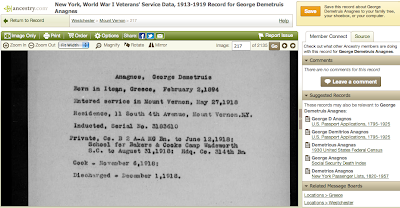 The documents in this database were assembled by two state historians, James Sullivan and Alexander C. Flick, who were tasked with preparing a history of New York’s role in World War I. Local historians were assigned to gather materials on their communities as part of the effort. Though the history was never published, the files have been preserved at the New York State Archives. Though the forms have spaces for parents’ names and addresses, these have usually been left blank. The files may also include newspaper clippings, transcripts of letters, descriptions of service made by the veterans or historians, and photographs of some of the soldiers. Some details are included on nurses’ service as well, and the photographs include some women. Other documents in the files relate to efforts on the home front by the state’s schools, faculty, students, and other organizations. Not all communities provided materials, so there are no documents for Bronx, Queens, or Richmond counties, nor are there many entries for New York City.